Lately, my blog has been inundated with spam. I have tried blocking a few of the servers that had been leaving me all the spam comments but the number of IPs have also been growing exponentially. If someone has a solution to this incipient problem, please let me know. This entry was posted in My 2 Cents and tagged comments, spam, wordpress on October 30, 2008 by a8le. WordPress as a CMS, its do’able but not so obvious; finding or understanding the information on how to do it can be quite complex. Now, you will need to make that specific page before you can set it as the frontpage. Please don’t tell me that what I am suggesting is simply a work-around. 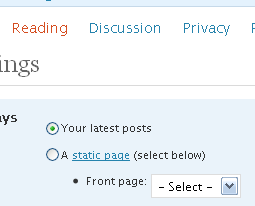 To me the only difference between WordPress and any CMS is the homepage’s content. Beg to differ? Comment Away. This entry was posted in Web and tagged cms, wordpress on September 6, 2008 by a8le.